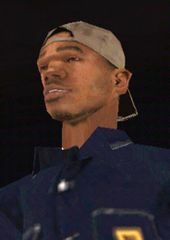 Mark Wayne, also known as B Dup, is a character in the 3D Universe who appears as a minor character in Grand Theft Auto: San Andreas (set in 1992). He is a drug dealer and member of the Grove Street Families. He is voiced by the rapper The Game. B Dup was born in Los Santos, presumably in Ganton, and later became a member of the Grove Street Families. By 1992, however, he had begun to drift away from the gang and its leader Sweet, beginning to sell drugs from his apartment to make money, later enslaving Big Bear by giving him drugs. Carl Johnson and Ryder later attempt to recruit B Dup to help kill some Ballas drug dealers in Idlewood but are turned away, with Carl later realising that he had begun working for the Ballas. Carl is later forced to leave Los Santos and during this time the number and quantity of drugs entering the city vastly increases due to Big Smoke and the Loco Syndicate in San Fierro. West Coast Talk Radio cover the increase in their news segment with B Dup saying that "the problem in the hood is that there isn't enough drugs". He also moves out of his apartment and into a house in Glen Park, taking Big Bear with him. Carl, after returning with the recently parolled Sweet visit B Dup after re-taking Glen Park for the Grove Street Families. There they meet Big Bear who, determined to beat his addiction and sick of the abuse from B Dup, leaves with them after punching B Dup. B Dup's name is a play on the words "beat up". B Dup on the floor after being punched by Big Bear, during Beat Down on B Dup. This page was last modified on 9 November 2013, at 23:55.